The adjustable seat allows you to sit at any level you desire and the full 360 degree rotation lets you adjust accordingly without too much movement on the cart. The cushioned top makes your session comfortable. When at it's highest, the Detailer's Rolling Creepster is the perfect height for polishing paint or quick detailing. With a massive 400 lb. weight limit and sturdy steel design, Detailer's Rolling Creeper will be with you for the long haul. Detailer's Rolling Creeper uses 5 wheel casters for stability and to prevent the stool from tipping over. The bottom plate conveniently carries all of your detailing bottles and tools, allowing for more productivity. Detailing Brushes make car cleaning easier! 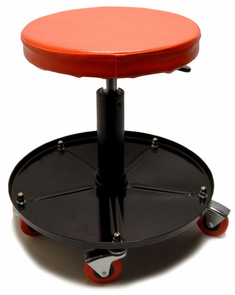 Very versatile stool to detail wheels or lower sections of your car. Easy to adjust the height and rolls easily even on asphalt. Great addition to my detail space! Easy to assemble. Makes detailing my Corvette much easier! This stool is great. I have arthritic knees, and the stool allows me to get to the lower parts of the car without the painful bending and squatting it used to take. Best money I've spent in quite some time! how did i live without a stool?